“I’LL RIP YOUR EYE OUT OF IT’S SOCKET AND PUT IT BACK IN BEFORE YOU EVEN REALIZED THAT IT HAPPENED,” my passenger hysterically screamed at me, while I drove him down the dark rural road between the University and the city. It’s during crisis moments like these that those scripture verses that you learned back when you were still trying to memorize the entire Bible from Genesis to Revelation, begin the seep into your consciousness from the deep dark recesses of your long forgotten memories. The two Bible passages that immediately came to mind were, the synoptic gospel stories about the demon possessed Gadarene man who screamed and gashed himself, while he lived in a graveyard, and I John 4:18, which states, “there is no fear in love; but perfect love casteth out fear: because fear hath torment. He that feareth is not made perfect in love.” (KJV) Introverting my thoughts and ignoring him enraged him further, as the volume of his voice continued to raise another couple of decibel levels, forcing me pay attention to his tirade, where he told me that he was a marine, who lectured at the university on the subject of contemporary history, when he wasn’t working as an orthopedic surgeon. He demanded that I acknowledge what he was saying and asked me my name as he explained why it was important for me to listen to his lecture. “My name is Bob,” I calmly told him. I already knew his name, since it was on the hospital bracelet that he gave me when he first got in the cab. 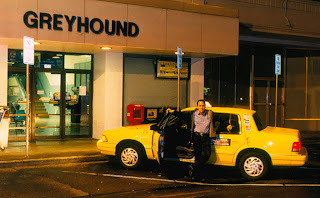 I picked him up at Corban University, after the security guard called for a cab. The problem with security guards and police, is that they dump the problems that don’t involve jail on taxi drivers, who then get stuck with deranged nuts, who sometimes couldn’t even pay the fare. This particular guard looked to be in his late 20’s and his fresh face told me that he just wanted to get this guy off the campus, before an incident happened. Jim told me that he was 58 years old and was about 6 feet tall and thin, with a goatee and scraggly hair, wearing a plaid blue and black button shirt with blue jeans. Jim originally wanted to go to Bend, Oregon, which is estimated at $370.00, but the dispatcher told me that I could make the guy a deal. When I told Jim that I would do it for $300.00, he said okay, let’s go. Company policy is to always collect an out of town fare up front before leaving, to prevent the possibility of getting burned. When I asked him for the money he told me that he could pay either with a debit card or cash, but not until we got to the hospital in Bend. When I refused to drive him he went on the first tirade, and finally I agreed to drive him to Salem hospital, right here in town. On the trip there he went from one subject to another that including complaining about Obama, and telling me how he would lecture him about his mistakes one day. When we finally arrived at the hospital, the meter was at $18.10, and when I asked for payment, he told me that he didn’t have any money until he got his next social security payment. “But you told me that you had either cash or debit, when we started,” I said. I was nearly positive that the hospital wouldn’t pay, since they have to pre-approve all payments, and this was just a guy wanting a free ride. Nevertheless what else could I do, since he said that he didn’t have any cash. I opened his door for him and told him to follow me to the receptionist window. He was hobbling, and another person standing outside took his arm and helped him, so I got a wheelchair and had Jim sit in it, while I wheeled him in the front door of the emergency room. One of the security guards asked me if his name was Jim, and when I told him yes he said that he’d been in and out a dozen times in the past 3 days. When I got to the front desk, I asked one of the 4 receptionists about footing the bill for the $18.10 fare. She told me that they didn’t do that, as Jim began to counter her saying that it was the law that they had to pay. “I’ll just write it off,” I told her, and as I turned to leave I said, “you can take care of him now.” When I got back in my cab I called the dispatcher and told him what happened and that I had an $18.10 no money. While I was waiting for another call at the Amtrack station, I was telling #3 what happened, with my crazy passenger, when #54 pulled in, to ask me what happened, since all the drivers can hear the dispatchers side of the conversation on their radios. After I told him and #3, he told me that he drove the same guy earlier and he wanted to go to either Independence or Albany, but didn’t have any money, and that he left him at a 7/11 after he failed to get any cash from an ATM, to pay for the fare he ran up with him.